Last Wednesday, 14h of February was Saint Valentine’s Day, a festival of love and one of the most romantic days of the year. For that, a group of students create a very nice initiative. It was simple, you only had to come to the office of Campus Life to reserve roses and give us the classroom number of the chosen one. That’s why all day long, some volunteers delivered roses to very lucky ones. Also it was possible to write a note which was delivered together with the rose. Now maybe some of us will know that they have a secret lover! Furthermore, for one rose, half of the price is donated to international solidarity missions carried out by UCH CEU. Some students decided to send it to their beloved one, some other to their bestfriend or just someone they love. Bryan Rouprich, an architecture student, offered two roses to his friend, Nicolas and Benjamin, both students of veterinary medicine. As you can see on some pictures and videos, it was not only between the students. 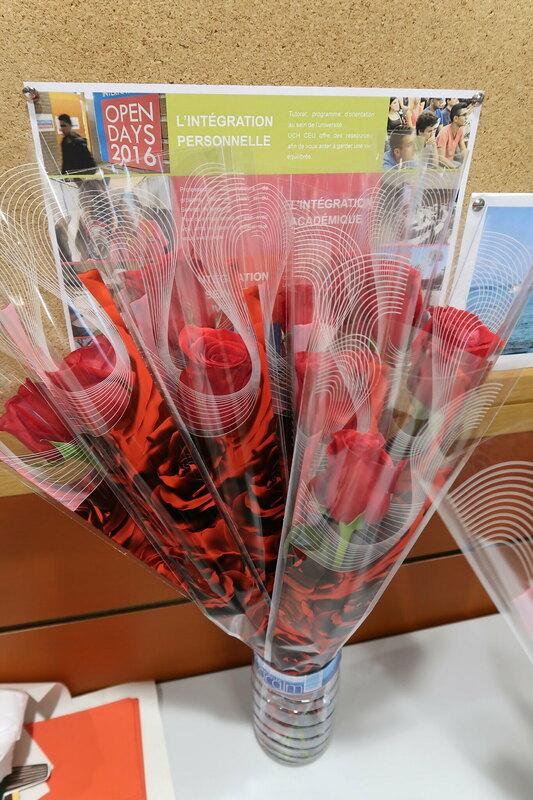 All members of the university had the opportunity to offer or receive a rose. It shows the good atmosphere that reigns within the university. It was wonderful to see all the people from the university giving flowers as a symbol of love and caring.